The admissions 2014-15 for BS (4 year) programs have been announced by Zakariya University Multan. These admissions are available in EPM, Criminology, Anthropology, Public Policy, public Finance, Library & Information Sciences, Social Work, Special Education and Public Administration. FA/FSC/D.Com with at least 2nd division is the qualification for these programs. Application forms can be submitted till September 25, 2014. This entry was posted in Admissions, Universities on August 30, 2014 by admin. Azad Jammu & Kashmir University has declared the MBA and M.Com examination schedule. The starting date of these exams is 9th of September 2014. M.Com exams will be conducted in Govt. PG College for Boys Muzaffarabad & Bagh while MBA exams will be held in Govt. PG College for Boys Muzaffarabad. The university will send roll no. slips one week prior to exams to all the candidates. You can see details at www.result2013.pk. For BA/BSC annual exams 2014, Abdul Wali Khan University Mardan has declared the results. According to notification, 11843 students passed in these exams among 28122 total participants 42% remained the passing percentage. Position-holders’ detail is mentioned below. Position Name Roll No. Institute Acquired Nos. This entry was posted in News, Results, Universities on August 30, 2014 by admin. Multan, Baha Uddin Zakariya University Multan conducted the annual and supply exams of MSc Zoology and MA Philosophy for 2012 and 2013 few months before. BZU Multan started preparing the annual and supply exams result of MSc Zoology and MA Philosophy. The controller of Exams of Zakariya University Multan has issued the details according to which total 99 students appeared in the annual and supply exams of MSc Zoology in which 84 were passed while 14 students were failed. The result of one student will be withheld and it will be announced later. The result of the MA Philosophy will be announced later as total 6 students were appeared in the exams. The annual exams result of MSc Zoology was made available on the website www.result2013.pk so that the students can get the information from there. This entry was posted in Results, Universities on August 29, 2014 by admin. Gujrat, The Exams Department of University of Gujrat has declared the registration process for the annual exams of BA/BSc and MA/MSc for the year 2014 from Sep 15. All the private candidates, who want to participate in the annual exams of BA/BSc and MA/MSc for 2015, they can get their registration done with Gujrat University. According to the schedule, the candidates can submit their registration forms with the normal fee of Rs.2000 till 31 October. The candidates can also submit their registration forms with the double fee starting from 03 November to 28 November and with the triple fee from 01 Dec to 19 Dec 2014. The candidates can get the registration forms from the nominated branches of Bank of Punjab by deposing Rs.30 and they can also download the registration forms from the website of University of Gujrat. The candidates will have to attach the bank draft of Rs.2200 with the registration forms, which are downloaded from the website. This entry was posted in Admissions, Universities on August 29, 2014 by admin. The date sheet has been issued by the Board of Intermediate & Secondary Education Mardan for 9th/10th supply exams 2014. 2nd to 19th September and 24th to 29th September is the schedule for written and practical exams of SSC part 1 & 2 respectively. 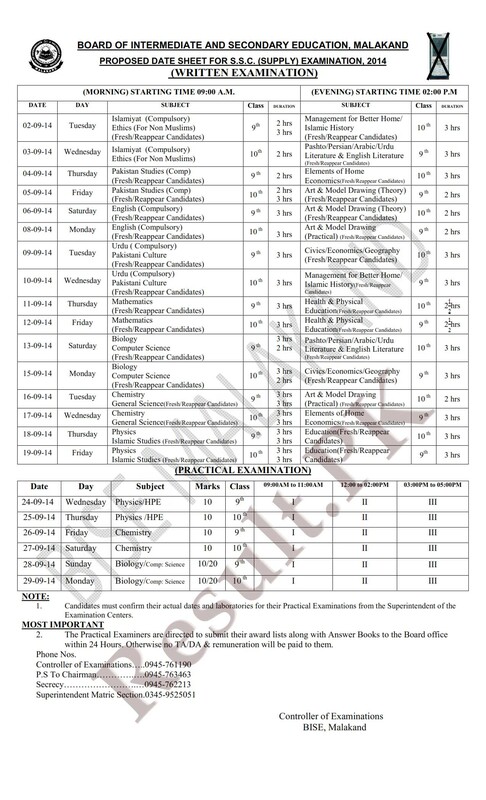 Complete date sheet is available at www.result2013.pk. This entry was posted in BISE, Date Sheet, News on August 29, 2014 by admin. The date sheet has been declared by the Board of Intermediate & Secondary Education Bannu for 9th/10th supply exams 2014. SSC part 1 & 2 supply exasm written and practical papers will be organized from 2nd to 19th September 2014 and 24th to 29th September 2014 respectively. Detailed date sheet is available at www.result2013.pk. This entry was posted in Date Sheet, News, Papers on August 29, 2014 by admin. The date sheet has been issued by the Board of Intermediate & Secondary Education Kohat for 9th/10th supply exams 2014. The written and practical exams of SSC part 1 & 2 supply exams 2014 will be held from 2nd to 19th September and 24th to 29th September 2014, respectively. We’ve provided complete date sheet at www.result2013.pk. This entry was posted in BISE, Date Sheet on August 29, 2014 by admin. The date sheet has been issued by the Board of Intermediate & Secondary Education DI Khan for 9th and 10th supply exams 2014. The written and practical papers of SSC part 1 & 2 supply will be organized from 2nd to 19th September and 24th to 29th September 2014 respectively. We’ve provided complete date sheet at www.result2013.pk. This entry was posted in Date Sheet, News on August 29, 2014 by admin. The date sheet has been declared by the Board of Intermediate & Secondary Education Abbottabad for 9th and 10th supply 2014 exams. The schedule for written and practical exams of SSC part 1 & 2 is from 2nd to 19th September 2014 and 24th to 29th September 2014 respectively. You can visit www.result2013.pk to see complete date sheet. This entry was posted in Date Sheet on August 28, 2014 by admin.